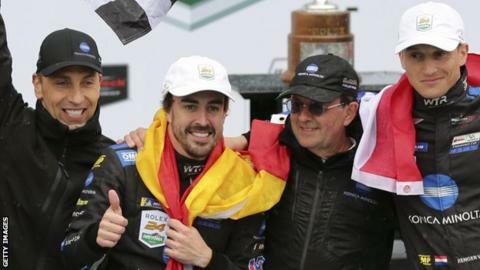 Former Formula 1 champion Fernando Alonso added another motorsport trophy to his cabinet with victory in the Rolex 24 in Daytona. retired from F1 at the end of the season but won a rain-affected race alongside Renger van der Zande, Kamui Kobayashi and Jordan Taylor in the Wayne Taylor Racing Cadillac. "Just an amazing experience - perfect execution for the race," Alonso said. "We were competitive in everything - dry, wet, night, day." Alonso is the third F1 champion to win after Phil Hill and Mario Andretti. The Spaniard - who has also won at Le Mans - made his debut in the Daytona race last year, finishing in 38th position. He will try to join Britain's Graham Hill as the only racers to win the triple crown of the Monaco Grand Prix, 24 Hours of Le Mans and Indianapolis 500when he competes in the latter for the second time in May. Most of the final eight hours of the 24-hour event was run under a yellow flag and racing was halted under red-flag conditions for the final two hours of the event. A result was finally declared after 23 hours and 10 minutes, with the Cadillac of Felipe Nasr in second and the Penske of Ricky Taylor in third.